Say hello to our brand new blog design! 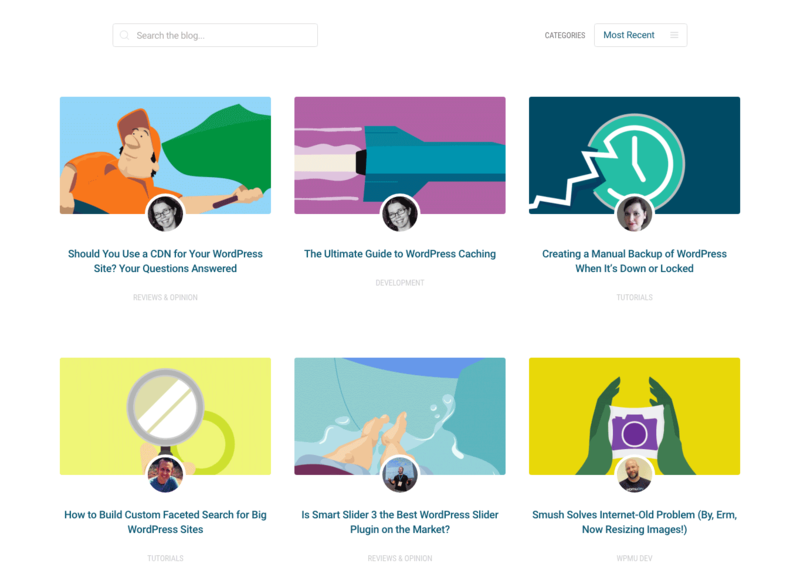 Over the past few weeks, we’ve been cooking up this new look to help make reading articles on our blog a more enjoyable experience. In other words, we want you to keep coming back for more (and share our articles, too!). Since our very first post went live back in 2008, we’ve published more than 4,600 articles covering just about every WordPress topic imaginable. Our blog has evolved a great deal over the years and we’re super grateful to have built a reputation as a go-to resource for WordPress. We also have a loyal following of regular readers who leave friendly comments on our posts (and collect Hero points when they do!). Over the years, contributors have come and gone (though our current team, I have to say, is exceptional), but our goal has always remained the same: To help educate and support our readers to build, grow and maintain WordPress websites and create value for their own customers and end users. Basically, we want to help you be awesome at what you do with WordPress. The WPMU DEV Blog now attracts more than 1.5 million sessions per month, but getting to where we are has had its ups and downs (as Google Analytics can visually attest to!). We want to continue to grow and deliver quality content and in order to do that, change is necessary. This blog redesign is our latest experiment in changing things up and improving what we do. In this post, I want to walk you through the new changes to the blog and why we’ve done it. Our posts look fantastic and are a joy to read on any device, even your mobile. So when you get our weekly blog update email on Thursday, be sure to click through to our posts and see for yourself! Oh, and we’ve added a dropped cap to the first word in every article… Just because they look really cool! We’ve replaced the search bar on the blog homepage with a featured article, which we’ll change up every week. Now you can quickly access our favorite article of the week the second you land on our homepage. Featured articles are now displayed prominently on our homepage. You can still search our blog – just enter what you want to find in the search bar directly underneath the featured article. Speaking of the homepage, it now has a grid layout. It’s without a doubt the biggest and most noticeable change in the redesign. We were super keen to update the homepage design to make it easier for you to scroll through our posts and quickly find what you what to read. Our blog now features a grid-style homepage so you can easily browse through recent posts and categories. There’s a new category in the dropdown on the homepage for Editor’s Picks. Basically, they are posts I love and want to highlight because they’re must-reads. WPMU DEV members can now favorite posts. Just click the star on any post you want to save to read later and it will appear in your list of favorite posts on your Hub profile. Cool, huh? This was a popular member request and we’re more than happy to now have this awesome feature on the blog. Save your favorite posts to your profile on The Hub and read them later. We have a fantastic team of contributors who write for our blog, from our Multisite expert Rachel McCollin to our development expert Daniel Pataki and Jack of all trades Jenni McKinnon. The problem with our old design, though, is that we didn’t give them enough credit in posts. Now, you can see their friendly faces at the top of every article, as well as a brief bio. Got a question about an article? Leave a comment at the bottom of a post and our contributors will get back to you. It’s also worth mentioning that our support team is on hand for prickly questions in the comments, though if you need a quick response it’s better to hit up the support forums, which are manned 24/7. We’ve gone VIP. After more than 430 free issues of our popular WordPress email newsletter, we decided to make The WhiP available only to members. But don’t stress – The WhiP is free to all 70k+ subscribers on Mondays. But if you want to get every WhiP, you’ll need to become a WPMU DEV member. If you’re unfamiliar with The WhiP, it’s our 3x weekly newsletter filled with curated, unaffiliated links that our editors hand-pick from the WordPress community and wider tech world. We keep you up-to-date on what matters most in WordPress. We’ll be launching a new landing page for The WhiP over the coming days, so stay tuned! The WhiP has gone VIP and is now available only to members on Wednesdays and Fridays. Thanks for reading! It’s thanks to awesome readers like yourself that this blog even exists and we get to publish WordPress resource every day of the year. What do you think of the new design? What do you love and what do you think could still be improved? Let us know what you think about our new blog redesign in the comments below! Upfront 1.2 Is Out, Try It For Free Today! Looks great. Last week I sent this blog to my designer for inspiration. Love these improvements, especially the favorites! :) Thank you. Love the new look. As a former subscriber and member, I’m always glad to see you guys advancing the art. Nice embedded pitch for me to reenlist. You are doing a great job promoting WPMU DEV and that the reason I joined the WPMU DEV Academy course “Dream Small, Market Big & Don´t Do It Again” with James Farmer. I recommend it to everyone with an online business idea that needs some invaluable advice and feedforward! We have a very talented illustrator on staff who’s responsible for all our fun images. Glad you like them! Also glad you’re enjoying James’ course! Would be interesting to know what percentage of people come to the website and got to the blog page as compared to just going direct to a blog article from a google link or email etc. ie. do many people actually see the blog page? I tend to come via an article link, but usually hit up the blog homepage to catch up on all the stuff I’ve missed. There’s always an article or ten I miss but feel compelled to read. Great changes, you guys are always an inspiration. Before I used to Google the things I wanted to learn and find your blogs. Now I just spend all my time in WPMU blogs, it’s like an ocean of knowledge. My compliments to your illustrator, love the art work. Big fan. Great post about the blog changes. I was really happy with previous versions yet I do agree that it’s a bit more of a comfort read with the help of typography. While the content is stellar regardless, I hope these aesthetic changes attract a new population into membership here at WPMUDEV. On a side note, I would also like to add that I’m finding the new layout and look to be an invitation to write and share. An inspiration of sorts that makes me want to work on my writing skills. Hey Jason, glad you’re enjoying the new look! We put a ton of work into it and we’re really pleased with how it’s turned out. Good luck with your writing! Keeping a blog is definitely a great way to improve your writing skills. I have always had a high level of trust for the information I find in your articles. It’s a go-to source on so many topics. And I never have to wonder if the information is peer-reviewed or credible. That saves me time in extra searches I DON’T have to do in order to confirm the information. And I too must give props to your graphic designer – they rock, whoever they are. And yes, props to Julian our illustrator! He’s fantastic.